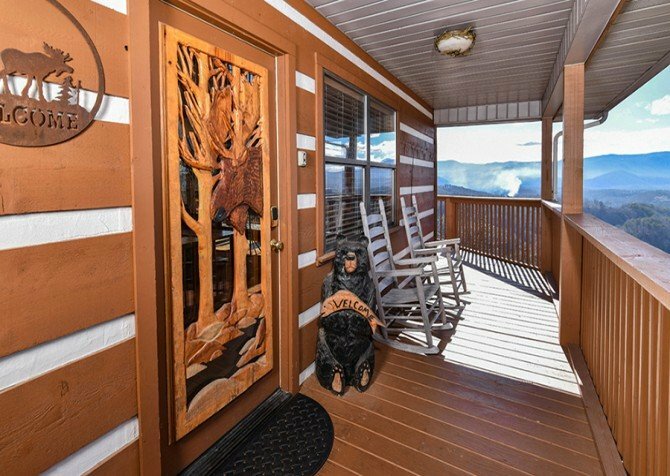 Invite friends and family to reconnect with nature in the Great Smoky Mountains at Dream Catcher Spirit, a 5-bedroom, 5 ½-bathroom cabin in Pigeon Forge with tree-studded views and amenities galore! Roast marshmallows over the outdoor firepit, warm up from a winter walk by the heated electric fireplaces (2), whip up a homecooked meal in the fully equipped kitchen, watch your favorite film series on the big screen TV, soak in the outdoor hot tub on the covered deck, play for hours on end in the rec room, unwind in your suite’s private indoor jetted tub, and snuggle up for a snooze in one of 4 king-size beds. 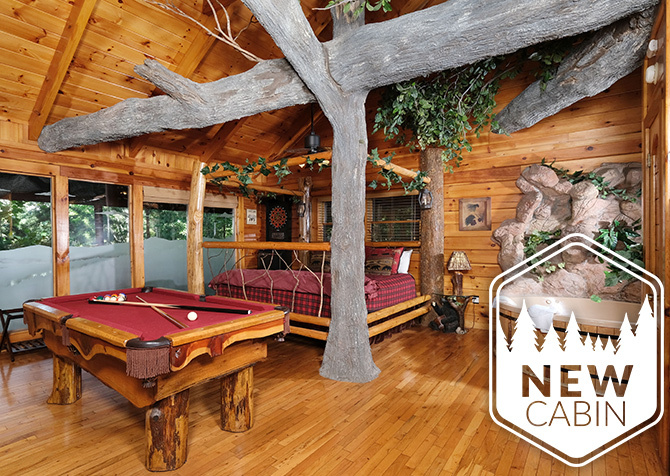 From spending time outdoors to relaxing in the cabin, cherished memories are sure to be made at Dream Catcher Spirit. 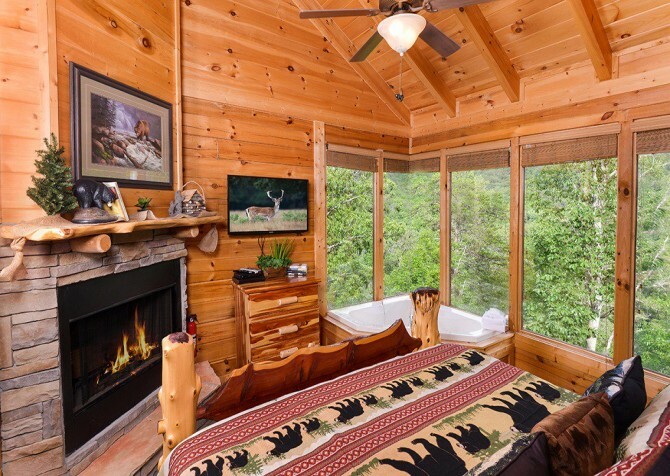 When you arrive to this dreamy cabin, head straight for the living room to take in the wooded views from the floor-to-ceiling windows — bringing nature indoors 24/7. Chill with your spouse on the couch, chat with a friend in the wingback chairs, or take a cat nap in the recliner. As evening approaches, get a fire going in the heated electric fireplace to set the mountain mood, flip on the big screen TV, and press play on your favorite DVD. No matter the time of day, this room conveniently wraps comfort and entertainment into one space. 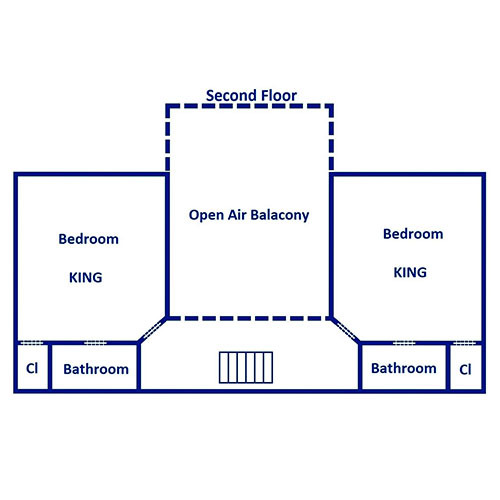 It even has a sleeper sofa for some extra space for guests. Easily serve up meals at the wooden dining table for 8, mere feet from the kitchen counter. Let the teens enjoy their privacy in the living room while the kids sit at the kitchen bar and the adults dine at the table — it’s win-win! After meals, clear the table for board games, card matches, coloring time…you name it. With deck access nearby, enjoy a gentle rock in the rocking chairs while the kids tackle arts and crafts inside. After your dessert settles, venture to the rec room downstairs for a rousing round of pool, an exciting match on the arcade unit, and a foosball battle to end them all. When you’ve finished cheering for your friends, hop on the couch to root for the hero on the big screen TV. Interested in a good read before bed? Check out a book from the mini library — you may just find a new favorite. Then let the kids pull out the sleeper sofa and have a sleepover in the game room! Speaking of hitting the hay, this home boasts 5 bedrooms, 4 king-size beds, and 2 twin-size bunks. 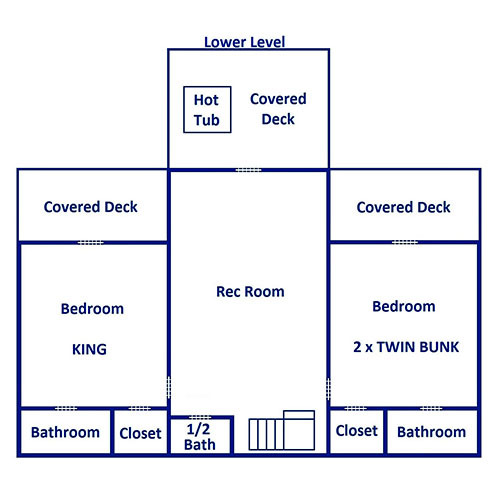 While each bedroom features a flatscreen TV, 3 bedrooms have deck access, 2 bedrooms harbor an indoor jetted tub, and 1 bedroom even comes with an electric fireplace. Enjoy a rose-scented bubble bath every evening, watch a show or two every night, and sleep in every morning — this is your vacation, after all! 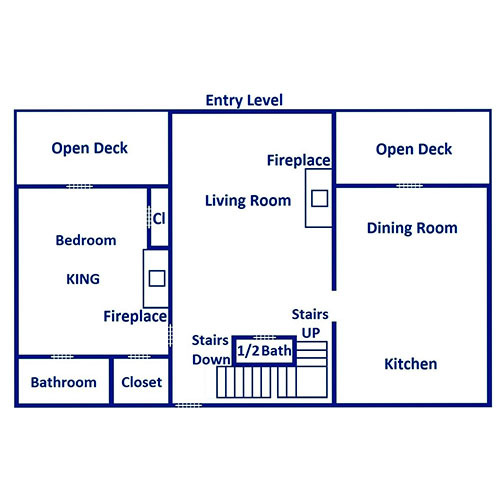 Plus, there are 5 full bathrooms and 2 half baths, making getting ready to go to town super convenient. Pull up the flat, paved driveway (with parking for 6) and walk 1 step up to your completely secluded cabin — oh, what peace and joy. Featuring multiple decks, a firepit area, a breakfast table for 2, and a picnic table out front, the outdoor spaces at this home make it easy to enjoy nature. 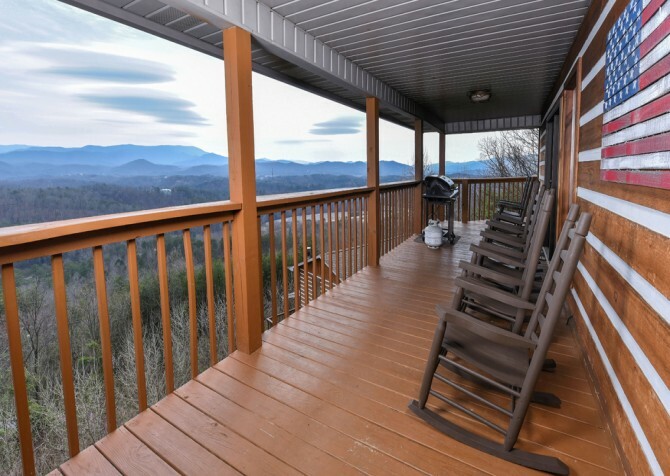 Rock your troubles away on the rocking chairs, barbecue tender steaks on the charcoal, picnic-style grill, swap ghost stories by the fire, and take a relaxing soak in the hot tub. Leave extra suitcases at home and pack light this vacation by taking advantage of the provided washer and dryer. Need to keep up with emails? Feel free to utilize the complimentary Wi-Fi. Don’t forget to leave the cabin every once in a while (if you can bear to leave the coziness) for an adventure in Pigeon Forge! Escape Leonardo da Vinci’s workshop, experience the paranormal at St. Sebastian's Home for Children, or solve a military mystery at Kryptology Escape Rooms...if you dare. Schedule an entertaining show with your meal at Dolly Parton’s Stampede — get ready for oohs, ahhs, smiles, and cheers! Get a birds-eye view of the city at Zip Pigeon Forge, featuring 11 ziplines and beginning atop the Pigeon Forge Sky Dome. "Dream Catcher Spirit, lives up to its name, the trip was a DREAM come true. I had wanted to celebrate my birthday with my mom (who’s 91), husband, children and grandchildren so it was 4 generations all together. The sight of it caught your eyes, beautiful, the peace and being so high allowed my spirit to drink in GODS handy work. How awesome He made creation the sky speaking loudly that He is GOD!! It rained everyday, we managed to grill out and good thing we had the game room…"
"Dream Catcher Spirit, lives up to its name, the trip was a DREAM come true. I had wanted to celebrate my birthday with my mom (who’s 91), husband, children and grandchildren so it was 4 generations all together. The sight of it caught your eyes, beautiful, the peace and being so high allowed my spirit to drink in GODS handy work. How awesome He made creation the sky speaking loudly that He is GOD!! It rained everyday, we managed to grill out and good thing we had the game room occupied and even mom played pool. Home is where the heart is and we felt at home with so much love was in that place. A birthday I will never forget! Thank you." "We stayed at Dream Catcher Spirit. It was beautiful. We had a great time. The cabin had everything we needed. As soon as you walk in it blows you away with the view. My family of 6 had a wonderful time. The kids loved the game room. I highly recommend this place."